Garden Club occurs every Friday at lunch in the main garden for students in 1st-6th grade. Our garden coordinator, Stephanie Murphy, starts with a unique and interesting lesson, followed by some garden work where students earn a treat! Parents, grandparents and community members are encouraged to attend garden club on Fridays from 11:30am-12:30pm! No notification necessary- just show up and join in the fun! Questions? Contact our garden coordinator, Stephanie Murphy. 3/29/19: What in the World Is Chicory? There was a flurry of moving parts in Garden Club on Friday. We are continually amazed by our garden TEAM and how wonderfully everything comes together each week. Students harvested, cleaned, chopped, and mixed in an orchestra of movement culminating with an amazing pear and cabbage slaw as well as raw Romanesco broccoli for the tasting table. You must have the slaw recipe! Students gobbled it up, asking for 2nds, 3rds, and 4ths! Hint: Kids have tiny mouths, therefore we shredded the onion and cabbage very finely in a food processor. We also suggest using less onion, or perhaps a less pungent white onion. Students also collected branch prunings from The Patch and loaded them up in the wagon for a trip to the dumpster next week. Students added top soil to the sugar cane bed, to replace that which was lost during harvest and, lastly, the remainder of the Napa cabbage was harvested and the bed prepared for the next planting, which also included adding new topsoil and mixing it in with the native soil. Thank you to all the students and parent volunteers who help to make this such fun. We hope to see you in Garden Club next week, March 29th. If you have any questions or comments, please contact Garden Coordinator Stephanie Murphy. Look at these kids working hard! In fact, this is an exemplary example of Kerry and John managing four teams working on separate projects in The Patch. In the two raised beds in the foreground, students are preparing the soil for the April 4th Sweet Potato planting project in the 2nd grade science classes, on the fence is a team of students trimming off branches that are encroaching our garden, blocking out sunlight and, lastly, it is a parade of students all taking part in the harvest of one Romanesco Broccoli (each with their own leaf of the plant) which was served on the tasting table. Way to work the projects team!!! Other projects completed this week included taking sugar cane scraps from last week's harvest to the dumpster, cutting up tangerines harvested from the Kinder-Garden (for the tasting table), weeding, harvesting wildflowers and removing spent plants. As a fun little tour, students were invited into the greenhouse to see how last weeks seed starts are progressing. A little of everything growing right now! Note - Garden Club will not meet next week due to 1/2 days for conferences (shortened lunch periods). Any questions or comments, please contact Garden Coordinator Stephanie Murphy, or simply join us next time! ​Friday, students harvested a number of crops for the free after school farm stand. We hope you enjoyed the produce, as well as the plants that were donated by Bonnie Plants. We harvested Romanesco broccoli, cabbage, kale, lettuce and greens, herbs, sugar cane and sweet juicy tangerines! High five to the students who helped harvest the two crops that required quite a bit of teamwork. The Romanesco broccoli plant was larger than most of the students and put up quite a fight! The sugar cane had endless stalks that needed to be cut to size with loppers, then washed. Students also started almost two dozen types of seeds to "begin again". Some of the tasty crops to look forward to are cucumbers, basil, strawberry spinach, celtuce, Chinese Shawo Fruit radishes, several varieties of peppers and sunflowers, Hungarian Blue Bread Seed poppies, marigolds and Thai Double Blue Butterfly peas whose flowers are used to make beautiful blue tea and other drinks. On the tasting table were sugar cane and tangerines. Parents are always welcome and encouraged to join us for Garden Club on Fridays! If you'd like a heads up about what's going on each week, email Stephanie Murphy to be added to the Garden Club email distribution list. 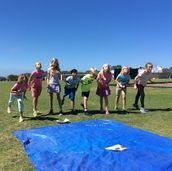 A Big Shoutout to Solana Beach Presbyterian Church! ​When you arrived back at school after Ski Week, we are sure you noticed how neat and tidy the gardens looked. 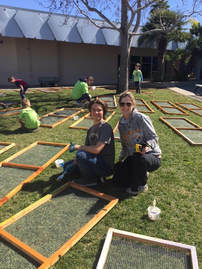 We are so grateful to the adults and children from Solana Beach Presbyterian Church that came to our school for a Community Service Day in our gardens. ​The volunteers helped with much needed weeding, raking, picking up trash and many other tasks. Compost bins were processed and the nutritious compost spread in our raised beds, topsoil was added to some of the raised beds (in preparation for our 2nd grade science class sweet potato planting project), benches and sink boards were sanded and weather sealed and deeper trenches dug under our sinks so the water would drain more rapidly. We generously thank our community partner - Solana Beach Presbyterian Church - for graciously carving out a bit of their busy day to help beautify the Del Mar Heights gardens for all to enjoy. While preparing the garden for Garden Club on a recent Friday, a student stopped by on morning recess and asked "what do you do in Garden Club?" One activity mentioned was harvesting, and the student was given an example and shown a crop that was harvested the week before. She looked at the crop and said "if you harvested it last week, why is it still there?" Good question! "Cut-and-come-again" is a method of harvesting crops to extend their production, sometimes for months. Crops that can be cut, and come again, include Napa Cabbage, leaf lettuce, many greens, kale, celery, cilantro and others. By harvesting just the outside leafs, leaving a good handful of leafs or stems in the inside of the plant, it continues to produce fresh new leafs that "come again" from the center of the plant. Ta Da! By the way, if your student is interested in Garden Club, there is no sign up, just show up promptly when lunch recess begins. All instruction and tasks begin immediately so remind your student to come directly to the garden (on time) if they'd like to help. Helpers get to taste whatever is harvested and prepared for that day. In other good news, Friday March 1st, we will be starting a bunch of seeds for our next wave of crops. We'll also be harvesting more sugar cane, greens and tangerines for a FREE AFTER SCHOOL FARM STAND that starts at 2:15 in the front of the school. Students harvested everything available to give away at a lovely after school farm stand. We gathered Napa cabbage, regular cabbage, Scarlet Bor kale, sugar cane, Swiss chard, Romanesco broccoli, chicory, Devil's Ear lettuce, Miner's lettuce, kohlrabi, wildflowers, cauliflower stalks and leafs, and cute little tangerines from the Kindergarten garden. We really hope you enjoyed the bounty as much as the students enjoy growing and harvesting it. For the tasting table, we sampled one of the Romanesco broccoli heads. Everyone loved it. We also offered a delicious tahini based dip which, surprisingly, received a thumbs up. With the upper grades, we had time to harvest some of the sugar cane, so we peeled and served it right up! The students, and even some of the adults, were surprised how sweet it was. Believe it or not, we also had a tiny bit of time to weed and pick up trash! Thank you everyone for a phenomenal day in the garden!! Questions about Garden Club? please contact Stephanie Murphy. 2/1/19: Trust Us, Your Kids Love Veggies! Last week students harvested 4 lovely heads of broccoli and gobbled it up on the tasting table. This week, they harvested and "shaved" the broccoli stalks and made a light dressing for a simple, amazing treat. We really think you should try this at home! Students also harvested, washed and dried the beautiful Devil's Ear and Paris Island lettuces, a bit of spicy Chicory, peas and strawberry guavas ... gorgeous and tasty for our tasting table. We also sampled Miner's Lettuce (a California Native eaten by the early miners for vitamin C). Was your student a dipper, a painter or both? Students could dip their lettuce leaf of choice (or pea pod) into either of the two dressings or "paint" it on. The delicious Buttermilk dressing was also a hit! Chores this week included harvesting the last of the scrumptious peas and removing the vines, raking, weeding, deadheading, removing leafs from branches for the compost, thinning loquats and planting celery that we started from seed a few weeks ago. We'll be starting seeds for summer crops very soon. Can you believe it is time already? If there is a summer crop you or your student would like us to try growing, please contact us soon and we'll give it a try. 1/25/18: Gorgeous Day for a Harvest! ​Gorgeous, with 100% certainty of an amazing harvest! On a beautiful afternoon, students harvested cabbage, broccoli, cauliflower and peas. Crops were cleaned, prepared, and assembled for the tasting table. The cabbage, peas (and an apple) went into an amazing cabbage slaw, which the students loved. The broccoli and cauliflower were broken in to bite-sized pieces and dipped (or not) into the extra cabbage slaw dressing for a heavenly treat. Attention parents, your kids love this stuff! Students deadheaded flowers, raked, weeded, removed branches, and worked as teams to keep our garden productive and looking magnificent. Parents - Please join us for Garden Club the next two weeks - Fridays, February 1st and 8th - 11:30 - 12:30. There are no Garden Club meetings on February 15th or 22nd due to Ski Week :) Contact Stephanie Murphy if you have any questions. Free Ferraris for parents who volunteer in Garden Club! Ok, kidding, but we really need your help or Garden Club won't survive. Friday, we had one volunteer - for a total of two adults supervising 40-50 students and a multitude of tasks. The kids show up ready to work even when the volunteers don't! Although it may seem as though we are getting along fine, the students could be learning so much more if we had volunteers to instruct and supervise them. Don't worry, there's no gardening experience necessary! We'll tell you everything you need to know at 11:30 when you arrive. Questions? Email Stephanie Murphy. Garden Club will be on break for the MLK holiday. Please join us when we return on Friday, January 25th at 11:30am. We'll be harvesting and preparing our sugar cane for juicing. While you were away, many of our trees received their winter pruning and dormant spray; most notably, the beautiful peach tree in the Kindergarten Garden, seen as you head down Boquita Drive toward school. Keep an eye on that beauty as it will be covered with a lovely show of pink blooms in about a month. Is your mouth already watering for those delicious white peaches? Friday in Garden Club, students will be harvesting and sampling veggies that sized up over break. Students will also be planting out some of the seedlings planted from seed a few weeks ago. And about that New Year Resolution... we need more parent volunteers in Garden Club. There are only 15 more Garden Club meetings this school year; we hope you can join us for a few of those! 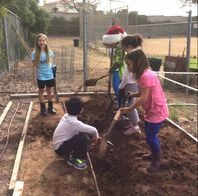 This week in Garden Club, students finished removing the leafs from the last two espalier apple trees in preparation for pruning, raked, watered the compost bins, weeded, removed arils from pomegranates, picked up trash and harvested peas, strawberry guavas, garlic chives and Chinese cabbage! For the tasting table, students shelled the peas, washed and chopped the Chinese (Napa) Cabbage and garlic chives, then assembled and served a delicious Napa Salad, along with yummy crunchies for all to enjoy. We think you'll want this recipe, the students gobbled it up ... the dressing tasted delicious on the fresh peas too! Tucked away from previous harvests this fall, and also served Friday, was dried and pickled Lunchbox peppers as well as pickled kohlrabi. We were also happy to share the remainder of our pomegranates with students and their teachers. We'll miss you! This week was the last Garden Club meeting of 2018! Please join us on Friday January 11th when Garden Club resumes. And, how about this idea for a little New Year's resolution ... volunteer in Garden Club and see what all the fun is about, while also supporting this amazing program. Already volunteer in Garden Club? How about recruiting a friend? We REALLY need more volunteers. Thank you and have a fantastic Winter Break! Email Garden Coordinator Stephanie Murphy if you have any questions. ​The rain barrel - and our tummies - are full, full, full! Thank you to everyone who shared a beautiful afternoon with us in Garden Club on Friday! The students were very productive planting kale plants and several six-packs of various seeds (for planting out after break), raking, weeding, removing pomegranate arils, picking up trash and continuing to prepare the apple trees for winter pruning. Remember all those strawberry guavas the students have been harvesting and squirreling away? This "sleeper" fruit was magically transformed into beautiful strawberry guava jelly and strawberry guava juice. Several students helped prepare our tasting table treats of jelly crackers and juice cups. Also on the tasting table was pomegranate arils and pineapple guavas. Have we mentioned how amazing our garden is? Please be sure to join us next Friday, December 14th as this will be our last Garden Club meeting until January 11th. We'll be sharing more preserved treats which were grown in our very own garden this fall. 11/30/18: Poms and Greens, Baby! ​Of course, we are speaking of Garden Club on Friday! Our amazing students harvested crops from almost every raised bed and barrel. We collected several types of lettuce and greens, as well as lots of veggies. The students washed, dried, chopped and compiled an amazing "everything" salad, topped with pomegranate vinaigrette - which was made using juice from our very own pomegranates. Many students asked for seconds and one student enthusiastically proclaimed "This is the best salad ever. It's true." Students also prepared a pomegranate juice drink, again using juice from pomegranates grown right here in our garden. Another delicious hit. Lastly, students removed arils from even more of our pomegranates and enjoyed those at the tasting table as well. To prepare for winter pruning, students started removing leafs from our apple trees. This process forces the trees into a brief dormancy which would not otherwise happen in our mild climate. And, to those of you who witnessed the peach tree in the Kinder Garden being stripped of leafs Friday morning, this is the same process. While some of you guessed that the storm had knocked off all those leafs, they are actually removed manually this time of year in order to prepare the tree for dormant spray and pruning ... a simulated "winter" so to speak. This week in Garden Club, students planted a large variety of veggies, pulled weeds, removed pepper plants, raked, and harvested Lunchbox peppers and strawberry guavas. In the kitchen, students helped assemble and serve pumpkin pie smoothies, which they loved. We decided if we made it again, we'd use regular vanilla yogurt, not Greek, for a more smooth/sweet taste. Click here for the recipe. Last week we had an abundance of Lunchbox peppers, so they were pickled in order to preserve them for this week's meeting ;) They turned out a little bit spicy by that didn't stop our gardeners from gobbling up two quart sized jars worth! Since they were so popular, we'll also be pickling the batch of peppers we picked this week! Click here for the recipe. And, while not as plentiful as we planned (due to theft), students got to take home apples from our apple trees this week. ​Lastly, Garden Club will be on break due to conference week and the upcoming holidays. Our next Garden Club meeting will be Friday, November 30th. Since about 60 kids participate weekly, we are still looking for volunteers to help. No garden experience necessary! If interested, contact Garden Coordinator Stephanie Murphy and she'll add you to our email list. Students finished assembling our new red wagon! Thank you Dylan for the extra muscle power that was necessary to tighten the bolts all the way. After a test drive, students put it to work by taking a bag of trash to the dumpster. Results reveal that the ride is smooth, quiet, and has good suspension. We also took the old creaky one for a test drive, just for comparison. Whoa, what a difference! Nice job everyone. Several chefs worked quickly preparing apples for our apple pie (sans crust) snack. They chopped apples, added brown and white sugar, some calamansi juice, a few drops of coconut oil and a few shakes of cinnamon. It was amazing! Who needs crust anyway? Students also raked the main garden, took leaves to the compost bins, spread 8 bags of top soil in 2 raised beds in The Patch, planted two more half barrels with "Italian Late" garlic, planted chicory, removed caterpillar eggs from the tree tomatoes, harvested apples and peppers (which were sent home with a few students), weeded, and prepped a 1/2 barrel by separating old roots from the soil. Talk about productive! 10/12/18: Peppers, Planting, and a Little Red Wagon! ​Have we mentioned lately how awesome the DMH students are? And it never seems like there are too many cooks in the kitchen! :) This week we had lots of helpers chopping up our Lunchbox Peppers - and the first few apples - from our garden! Yay! See, if we wait long enough, fruit will ripen and be delicious. Both treats were gobbled up quickly after working in the garden. Lastly, we updated the sunflower seed recipe to include the Dill Pickle and BBQ flavors, as we have received many requests. Click here for the recipes. 10/5/18 - Sweet Potato Pie Smoothie? Oh Yes, We Did! It was a very busy day in Garden Club on Friday. Thank you to all the volunteers who helped this week!!! Students finished harvesting sweet potatoes and made Sweet Potato Pie Smoothies, practicing a little math along the way. The kids loved it! For the recipe, click here. Students also harvested a few hot and sweet peppers, pumpkins, and tiny gourds for the FREE After School Farm Stand. 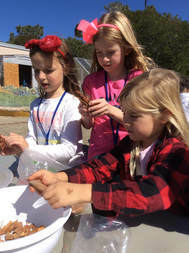 Students enjoyed previously harvested sunflower seeds. For the recipe, click here. Lastly, students planted two types of onion seeds and one variety of garlic. Congratulations to the "Pie Eating Contest" winners who won a school-grown pumpkin at Harvest Fest! These pumpkins were retrieved during recess on Friday. If your child won a pumpkin but did not have a chance to pick it up, it is now in the office. 9/28/18 - Worms, Sweet Potatoes, and Yummy Sunflower Seeds! Thank you to the parent and grandparent volunteers who helped in Garden Club on Friday! Students prepared the worm bin by layering torn up newspaper, dried leaves, and a few fruit scraps. We're sure the worms will be very happy there. Students removed pumpkin, bean, and sweet potato vines, and the last sunflower stalks. Did you know our 3rd graders will harvest their sweet potatoes during science this Tuesday?! We have been having an issue with people picking fruit from the garden, so students hung up several "do not pick" signs. We really hope this will help so we can harvest some apples and pomegranates this year. 9/21/18 - Sunflowers, Pumpkins, and Popcorn! 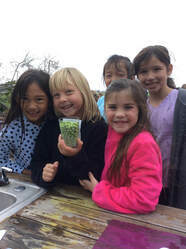 Friday in Garden Club, students planted out three raised beds with lots of veggies such as kohlrabi, Chinese cabbage, 2 types of broccoli and peas (in a 1/2 barrel)! Farm Stand will be here before we know it! Students also removed the sunflower stalks from last week (which isn't nearly as easy as it may seem), and chopped them up for disposal. We also removed sunflower seeds from the heads so we can roast them for next week's snack, and harvested a bunch more pole beans. Students moved the pumpkins up to the top row of The Patch; these pumpkins will be used as prizes for the Pie Eating Contest at Harvest Fest! Over the next few weeks, students will be preparing the area for a new gardening adventure. Lastly, two students served our fantastic school-grown popcorn. It was delicious! Whoa, what TEAMWORK! How absolutely amazing it was to see so much enthusiasm in Garden Club on Friday! It was quite a whirlwind with approximately 70 students participating, but boy did we get tons done! Students harvested two types of sunflowers - one for us and one for the birds. Next week, students will remove the seeds in order to prepare them for roasting. We also harvested two types of beans, shucked popcorn to remove the kernels, dug out "underperforming" soil in four raised beds, and started sweet peas. The sweet peas are an annual favorite which we usually harvest for several months in the spring. On the tasting table were sweet and delicious lunchbox peppers, prepared by students. Next week's treat? Popcorn made with the kernels that were harvested today! WE NEED VOLUNTEERS!!! We can always use help with supervision, as this is one of the school's most popular clubs. Join us on Fridays during lunch in the main garden at 11:30am to receive instructions before Garden Club starts. Next Garden Club is on 9/21! ​If you have a suggestion or comment, please contact our Garden Coordinator, Stephanie Murphy. ​Friday, June 8th, was the last Garden Club of the school year. Boy, did we have a great year. Thank you to all the students and volunteers for your help, and best wishes to the 6th grade gardeners who are moving on! In Garden Club, students dug for potatoes, removed spent plants, weeded the sweet potatoes, picked up trash and helped with cutting and serving the tasting table treat. On the tasting table was Strawberry Dream Cake - regular and gluten free ... or just strawberries. The students loved the cake so here is the recipe, in case you "need" to make it. We hope you enjoyed the Farm Stand finale where we offered potatoes, onions, garlic, lemon verbena, sweet potato slips, sweet pea flowers, kale, mint and the last of the season peaches which were out of this world delicious! Free Farm Stand: Friday, June 8th from 2:15-2:45 p.m.
​This week, Garden Club students transplanted Tom Thumb Popcorn, which they started from seed a few weeks ago, and which is already nearly a foot tall! We are trying a dwarf variety this year (in hopes of outsmarting the squirrels) and keeping it protected under our nice new raised bed covers. Fingers crossed! Students also harvested the last of the spring crops, including greens, cabbage, onions, garlic, garlic chives, potatoes and a variety of colorful flowers. We collected all this goodness to share with you at the Free After School Farm Stand! We also gave away tons of gorgeous white peaches, picked just that morning. Lastly, we had a few leftover sweet potato slips from the 2nd grade science project, so those were also available to take home and grow. On the tasting table was "Blueberries with Cinnamon Clouds." Wow, what a heavenly hit! Thank you to the 1st graders who were in charge of filling the cups with blueberries, piping on the clouds, and then finishing with a dusting of cinnamon! The cloud recipe was promised to a number of students ... and maybe a few adults ... so here it is! This Week in the Garden: Peaches Anyone? Free Farm Stand: Friday, June 1st from 2:15-2:45 p.m. While the garden was "dark" this week due to the holiday weekend, we are revving up for two Farm Stand Friday Finales! The next two Fridays, June 1st and June 8th, students will be harvesting onions, garlic, garlic chives, potatoes, cabbage, flowers and greens for our Farm Stand. We will also have PEACHES! They're big, fragrant and juicy, so be sure to stop by and grab one. After the harvests, students will prepare beds and plant the seedlings they started in the last few weeks. We will also be planting more seeds (direct sow perhaps), tending the compost and worm bins, as well as pulling weeds and removing spent crops. Please join us for one of the last two Garden Club Meetings on Friday, June 1st, as well as Friday, June 8th. We hope to see you then! 5/18/18: Keep Calm and Chive On! This week in the garden, we reviewed the importance of proper plant tag labeling when starting seeds. Last week, we ended up with pots labeled only "Heirloom". We also gave a quick reminder of rattlesnake safety since this is the season. ​Then, students got to work weeding the sugar cane bed, harvesting sweet peas and other beautiful flowers, thinning apples and harvesting a special garden ingredient with which to make our tasting table treat: garlic chives! Kids washed them and made fresh garlic chive butter. We prepared crackers with a yummy dollop of GCB (garlic chive butter) and watched the treat vanish before our very eyes. The students loved the schmear so here is the recipe for you to make at home. We used garlic chives in place of regular chives. Leftovers are delicious on potatoes or bagels. There is no Garden Club meeting next Friday due to the holiday weekend. The last two Garden Club meeting dates for this school year are June 1st and June 8th. We hope to see you then! Questions about Garden Club? Contact Stephanie Murphy. ​Friday's cold and windy weather did not keep the DMH Garden Club students at bay! Students learned about the importance of planting seeds at the proper depth - according to the instructions on the seed package - and were shown a diagram of depths of 1/8", 1/4", 1/2" and 1". We also learned the importance of proper plant tag labeling which, surprisingly, includes the date! A demonstration of how to plant (and water) a seed was given. We started seeds of Tom Thumb Popcorn, French Gold and Rich Purple Pod Pole Beans, cucumbers and two types of sunflowers. These will germinate in the (warm) greenhouse for a few weeks then be planted in the garden sometime before school lets out. Students LOVED the Hibiscus Tea that was served on the Tasting Table and many asked for recipe so here it is! We added the full amount of sugar along with the ginger slices and allspice berries but feel free to adjust to your liking. We were surprised that the students guzzled down the cold drink on such a cold day, but this "tea" may also taste good hot! Next week we need to tend to weeds. They've been cropping up and need to be taken care of. Please join us at 11:30 on Friday, May 18th for weeding and more seed planting! 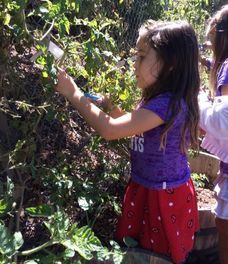 ​This week in Garden Club, students were reminded of the importance of not pulling on - or swinging from - tree branches. Sadly, a large limb of the loquat tree was pulled down and broken some time in the last few days. Other than that, it was harvest mania all the way! 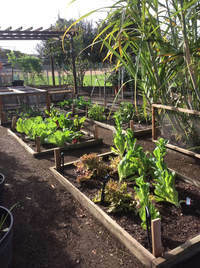 Students harvested several varieties of lettuce, white and yellow onions, leeks, kale, fennel, Swiss chard, multi-colored beets, sweet pea flowers and potatoes. We also had lemon verbena, and everything was given away for free at our After-School Farm Stand Friday event! Remember when we did the experiment on which would be better for growing potatoes: straw or dirt? Well, we did a "reveal" on one of our potato tower experiments (with straw) and are pretty sure this particular experiment returned no better results than hilling with dirt. We also have a 1/2 barrel experiment which we will look at in a few weeks. On the tasting table was creamy onion soup and onion dip. The students liked the soup more than we expected. Yay! Next week, Garden Club students will be planting up popcorn, peppers and other summertime crop seeds. If you haven't had a chance to join us, please stop by next Friday. There are only four more Garden Club meetings this year so be sure to get your garden fix before it is too late! Questions about Garden Club? Contact Stephanie Murphy. Garden Club & Farm Stand Friday Are Back! Farm Stand: Friday, May 4th starting at 2:15 p.m.
​This coming Friday, Garden Club will resume after our brief hiatus to harvest potatoes, onions, lettuce, chard, romanesco, beets, cabbage and, hopefully, some sweet peas. It will be a vegetable bounty for sure! Parents are welcome to help us with the harvest, starting at 11:45 am in the Heights Garden. All the produce will be given away at drop-off. Come early; goodies get picked up fast! This week, our enthusiastic and super energetic garden volunteers from Snooze Eatery came out to help us beautify our garden. We sanded and weather sealed the work tables, reworked two of the compost bins and spread the finished compost in our raised beds, hung a decorative bird house, raked, weeded and took garden debris to the dumpster. The garden looks so fresh and clean. Thank you to Snooze and all of our many Garden Partners! Join us next Friday, April 20th, when "guests" Mac and Pedro will be collaborating with Garden Club students for a special Earth Day edition with our Boomerang Picnic Lunchers! Students will help direct the composing of school, and lunches from home, into the compost bins in the garden. ​Over the course of the last few years, Garden Club students have learned about (and grown) many plants in the grass family, including rice, sorghum and popcorn. This week, students learned about two more plants from the grass family. Bamboo, which was briefly discussed, and sugar cane which was discussed in more length. Although both can be used to make furniture and other wood-like products, sugar cane is flexible and bamboo is not. We learned that sugar cane is chopped up, boiled with water and purified to make various types sugar, as well as the molasses by-product! It was interesting to see the looks on the students' faces when they viewed (and smelled) the molasses! Ewwww... Finally, students planted a few sugar cane stalks, testing different planting methods - two big long stalks buried whole vs. individual plants started from rooted nodes. Students then chopped up leftover stalks to take home and eat or plant. On the tasting table, students helped prepare beautiful, deep magenta beet dip, made from beets harvested last week, and cut up pita bread for dipping. This is a must have (and very forgiving) recipe that doesn't really taste like beets. We also tasted prepared sugar cane which most students thought was sweet but didn't really think tasted like sugar. Garden Club will be back on Earth Day April 20th. Have a fantastic Spring Break! Questions about Garden Club? please contact Stephanie Murphy. In Garden Club, students harvested piles and piles and piles of produce for our free after school Farm Stand! Can you believe we grew this all from seed?! The harvest frenzy included arugula, beets/beet greens, carrots, cilantro, fennel bulbs and fronds, greens, various lettuces, mache, mesclun, peas, potatoes, rosemary, spinach, sunflowers, sweet peas and Swiss chard. There might have been more, we lost track! Using some of the fennel from the harvest, students prepared a delicious fennel salad. If you were lucky enough to pick up a few bulbs at our farm stand, here is the recipe. The fennel and apples were cut into very small pieces. Feel free to add in any mix-ins instead of the arugula. We added mint, but you could also toss in cilantro, raisins, carrots or maybe something from the farm stand! Join us next week when we plan to continue our discussion on the grass family and clean up the beds we harvested from Friday. We will also prepare another delicious appetizer with some of our beets. Free Farm Stand Friday, March 23rd! Please join us in the garden next Friday when we will be harvesting like crazy for a free after-school farm stand! There will be bulb fennel, tons of greens and lettuces, spinach, mâche, cilantro, beets, cabbage, kale, carrots and the always alluring (but not edible) sweet pea flowers. In Garden Club, students will be making Fennel Apple salad with the fennel harvested directly from the garden. We know you are busy, but we could sure use lots of volunteers to help supervise the students while they are harvesting all those aforementioned lush crops and turning them into edible goodness. ​​Questions about Garden Club? please contact Stephanie Murphy. 3/9/18: Fun with Fennel Fronds! This week in Garden Club, students were busy thinning apples, cleaning out the broccoli and cauliflower bed and depositing the scraps in the compost, weeding and removing paperwhite bulbs and tending the worm bin. Our resident plumbers also reattached aerators to our faucets. They were handed a container full of parts and had to first figure out: 1) what the parts were; and 2) what to do with them. In the process, they learned that aerators are a great way to reduce water usage while at the sink! For the tasting table, students harvested, washed and prepared fennel fronds for our world famous Fennel Frond Pesto. Served on crackers, students loved it! If you want to love it at home, here is the recipe (we used mixed nuts and avocado oil). PLEASE NOTE: Next week, Garden Club will be on break for conference week. We'll see you back on March 23rd. Please come join us then! Parents are welcome! All week, Mother Nature promised that Garden Club would be rained out on Friday. Turns out she changed her mind at the very last minute. Our apologies for cancelling Garden Club; we really missed seeing everyone and working in the garden. ​While students were on Ski Week break, a group of nice folks from Solana Beach Presbyterian Church came out for a garden work day. We rearranged the work tables in the "kitchen", which we believe will make the area more functional. We also critter proofed (hopefully) the greenhouse, weather sealed the new raised bed covers, re-painted a bench in the Kinder garden, harvested and spread compost and completed a few other tasks. In Science class this week, 2nd graders started their sweet potato slips. Students will predict and study how the slips grow over the next several weeks. The slips will then be placed in water to root and, finally, be planted out in The Patch after Spring Break. ​Next week in Garden Club we'll be making a yummy appetizer with an unusual item from the garden. We will also be thinning apples, harvesting more compost and realigning/leveling the bins, weeding, cleaning out the broccoli bed and talking about a living fence! Time permitting, we will also be starting some seeds. ​Questions about Garden Club? please contact Stephanie Murphy. To make the beverage, our students cleaned and chopped guavas, apples, pears and sugar cane, studded tangerines with cloves and added water, cinnamon sticks and other yummy ingredients to the pot. They also learned about and prepared some of the Ponche ingredients such as tamarind that's very sour and comes from the pea family, sugar cane that's essentially a large tropical grass, hibiscus (Roselle) that was grown in our garden last summer, and piloncillo, an unrefined sugar cane sugar that was extremely hard and very difficult to grate. Have you ever seen three people using one grater? Talk about teamwork-and coordination! And finally, we added tejocotes which is fruit from the Hawthorne tree. Students tasted tamarind and sugar cane - a few snuck in tastes of piloncillo too. ;) Garden Club students were shown how to propagate sugar cane, and we're pretty sure they're up to the task! Please join us next Friday, March 2nd. We'll be making a delicious appetizer with an unexpected ingredient, right from the garden! ​This week in Garden Club, students learned about native bees ... you know, those "other" bees. Mason and leafcutter bees pollinate significantly more effectively than non-native honey bees. Have you ever seen evidence of a leafcutter bee in your garden? They especially like roses. ;) These bees are docile and don't sting (unless squished) because they aren't protecting a queen, a hive or a honey stash. They are solitary bees that work alone. In a honey bee hive there is a hierarchy of the queen, drones, and female workers that are each assigned 1 of 14 specific tasks. Mason and leafcutter bees do all the chores themselves, collecting pollen on their belly vs. pollen baskets on the legs of honey bees. The leafcutters cut a disk of the leaf to build a nest compiled of a cigar shaped row of single cells, each containing an egg and a supply of pollen, while Mason bees use mud! You can gather more sweet info on leafcutter bees HERE. A big thank you to Jessica from "The Bees Waggle" who most generously donated both a native bee habitat AND an observation house, as well as a few supplies to get us started! Students set up both houses in The Patch, planted wildflower seeds to supply pollen and mixed mud for the mason bees. We also hope to plant a rose bush soon. Then, we'll sit back and keep our fingers crossed for bees to build their nests, pollinating our crops in the process! Was it soup or was it salad? Garden Club students found out it can be both. In previous weeks on the tasting table, native Miner's Lettuce from our garden was served in salads. This week, students tasted Miner's Lettuce in soup! Gold miners used to eat Miner's Lettuce for the vitamin C. The students loved and devoured the soup! Here is an easy and forgiving recipe that can be used with any type of green. PLEASE NOTE: Our next Garden Club meeting will be Thursday, Feb. 15th (instead of Friday). ​This week, we harvested lettuce, arugula, braising mix, mesclun and cilantro. Students also successfully repaired an irrigation riser on their own with two parts and very little instruction--on purpose. ;) We were very proud of our resourceful garden plumbers! Students also planted sunflowers and lettuce and hilled up potatoes, among other tasks. On the tasting table, students sampled the much anticipated acorn bread - we had both regular and gluten free. Go here for the recipe. We also had a special treat of gluten-free acorn brownies (recipe here)! We definitely think acorn meal should be a super food! This particular batch of acorn meal was handmade by students over several weeks. They cracked acorn shells, removed the meat, ground it into flour, and experienced a food used thousands of years ago. Thank you to Lynda B. for collecting and donating the beautiful acorns that made our acorn project possible as well as enhancing the 3rd grade classroom studies on Native Americans! Next week join us to learn about a pollinating insect more effective than a honey bee! Also, is itsoup or is it salad? Come to Garden Club next week to find out! As an aside, next week will be our last Garden Club meeting in February. Garden Club will take a hiatus during Ski Week and return on March 2nd. Hope to see you next week! ​IMPORTANT NOTE: Please speak with your children about their allergies. Although we always ask students and clearly mark items with ingredients that have been provided to the office as allergens, some kids aren't sure of the specifics of their allergies. For example, some students said they were allergic to walnuts but weren't sure if they were allergic to all tree nuts or just walnuts. Others weren't sure what gluten is. We always try to offer an alternative for students who have allergies, but it would be good for children to know exactly what they can or cannot eat. Students harvested, washed and cut up "fresh from the garden" cauliflower, broccoli and broccoli raab - for the tasting table - of course. Cauliflower does not reproduce, or produce side shoots like broccoli so students removed the hefty stalk, preserving it - and those tasty green leaves - for roasting, grilling or sauteing. They also quartered Page tangerines - super delicious on the tasting table. We also weeded and tidied up three beds (peas/chard, garlic and onions) transplanted the beautiful and fragrant sweet peas, prepped an area for sunflower transplants and learned how to prune the cape gooseberry plant. ​And, the moment you've all be waiting for ... Shawii! If your student seemed to appreciate meals at your house a little more since Friday, we have a pretty good idea why. Upper grade students tasted acorn Shawii made from the acorns they cracked and ground into acorn meal. This is a Native American food that dates back thousands of years - and is still eaten today. The purpose of making and tasting acorn Shawii was to learn what the Native Americans ate on a daily basis, and the lengths they went to in order to survive. What does it taste like you ask? We'd say the results spanned the spectrum. Some students made that "crinkled up nose" face. Some students really liked it and asked for seconds. The taste is along the lines of plain oatmeal - somewhat tasteless - with a texture like polenta. After students tasted Shawii plain, they were offered honey to sweeten the deal. Next week, we'll continue using the acorn meal the students produced but we'll be using it in a non traditional way. Join us, you'll be amazed! Are acorns our next new super food? 1/19/18: Yes! Our Crops Are Covered!! ​A GIANT Thank You to the Dads' Club who built beautiful - and functional - raised bed covers for our gardens. Not only are these gorgeous, they will keep out those pesky critters who keep devouring our crops. Stop by and take a look! This week in Garden Club, students harvested the beautiful, but odd looking, "Crispy Colors Duo" Kohlrabi which was cleaned and served fresh and plain on the Tasting Table. The crispy white flesh was sweet and delicious and the students really loved it. One student even commented how sweet he thought the kohlrabi was. We also harvested and served the more familiar broccoli and cauliflower. By the end of Garden Club, everything was gone so we know the students enjoyed it! Now that all our raised beds have proper covers, we got busy transplanting the seedlings we started before winter break. Students learned what the word "fractal" means then planted the magically fractal Romanesco Broccoli as well as "purple sprouting" broccoli, radicchio, a giant cabbage, tree collards, two varieties of lettuce and spinach and the last of our seed potatoes to include Russet, Cherry Red and Buttercream. In a few weeks, keep a look-out for two towers of straw in The Patch. We are experimenting with potato towers. Because Russet potatoes are an indeterminate variety, we hope to grow two tall towers full of potatoes to see if we can produce more potatoes in a tower than in the ground. We are also comparing growth of potatoes purchased from the grocery store vs. a true seed potato. As the potatoes grow, straw (instead of dirt) will be used to "hill up" the potatoes. Hilling keeps out light which would cause the potatoes to turn green and become inedible. The acorn meal that the students produced by cracking and grinding acorns during the last two Garden Club meetings is finished being leached of tannins. Next week, students will open their minds to the experience of eating the way the Native Kumeyaay did thousands of years ago - and still do. The first of our acorn meal treats is traditional acorn Shawii which is basically acorn meal cooked with water. Please join us to appreciate how the Native Americans ate. It was a glorious day in the garden and the rain barrel is FULL! Wow, how about all that rain? Just what the garden needed after all that winter pruning! This week in Garden Club, students harvested like crazy to create a beautiful Farm Stand, loaded with mesclun and braising mix (which can be use in salads, cooking or smoothies), delicate mache (corn salad), several varieties of kale and lettuce, mixed varities of beets and greens as well as arugula, broccoli, broccoli raab and more! It was gone in the blink of an eye! ​Students continued with our acorn grinding project, learned about seed potatoes and "hollow heart" then planted Kennebec White, Yukon Gem and Cherry Red potatoes. While our lemon trees have not yet produced, this is the season for citrus so we went ahead and made Lemon Ice Cream for the Tasting Table. The lemon ice cream was a suggestion by a few students and everyone loved it! We also served Satsuma Tangerines. Keep those garden-grown treat ideas coming! Please join us next week. We'll be planting more winter crops and tending to garden chores. ​Wow, another amazing (and busy) day in Garden Club. Students in grades 4-6 learned the polar opposite of fast food. We started on a project to make flour ... from acorns, the way the Kumeyaay did thousands of years ago. We started by cracking acorns with rocks (and learned about acorn weevils), removed the meat and began grinding it with mortars and pestles. The acorn meal will be leached repeatedly over several weeks to remove tannins, which render the acorn meat inedible. From the finished acorn flour, we hope to make Shawii and/or bread for the tasting table. Students also learned about the Hoshigaki, a Japanese method for drying persimmons. The Japanese hung the peeled (astringent) persimmons from string. After about a month, and some gentle massaging, you get a beautiful piece of luscious dried fruit. On display were both an astringent and non-astringent persimmon. We also removed leaves from the apple trees to induce dormancy and prepare for pruning. And we planted the first of our six varieties of potatoes - Dark Red Norland - which should be ready to harvest in two to three months. Finally, students got to see the finished broom which we made from the sorghum (Broom Corn) stalks planted last spring and harvested earlier in this fall. Super cool! On the tasting table were Hoshigaki persimmon, as well as two flavors of persimmon fruit leather - plain and cinnamon-vanilla! All received lots of big thumbs up! The leather is easy to make, just blend up ripe persimmon pulp, pour onto oiled dehydrator tray and dehydrate for about a day! Lastly, unlike the acorn flour, time moves quickly! This was our last Garden Club meeting until after Winter Break. Please join us on Friday, January 12th, when Garden Club returns. 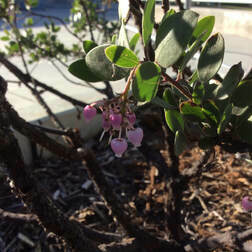 This week in Garden Club, students learned about a parasitic plant and were able to see a real live one: mistletoe! We learned how the mistletoe seed manages to get to the top of a tree but, more importantly, how it stays there. Students were busy harvesting pomegranates and removing the arils for the tasting table. They also tested the pH in the blueberry pots and potato trenches, made labels for our blueberry plants, prepared apple trees for dormancy, removed pomegranate tree suckers, worked on the potato trenches, dug for (but not finding any) sweet potatoes (darned critters! ), fed the worms, helped toss and serve the "Bring Down The House DMH Chopped Salad." Ya, we made up that name, but the salad was a huge hit and worthy of the title! It was made with a number of garden-grown greens, including arugula, romaine and leaf lettuce, chard, kale, Miner's lettuce, mustard greens and mesclun. Some students sprinkled the pomegranate arils on their salad and some just ate them plain. Many of the students asked for the dressing recipe so HERE it is. Three tips: add more honey, omit the minced onion, and tear or chop the greens into very small pieces. ​Next week, Garden Club is going back in time, way back! Upper grade students will start a project of making food the same way Native Americans did thousands of years ago. We'll also be doing a little Hoshigaki, so join us to find out what that means and prepare yourself for a crazy-fun time! PARENTS: There are only two more Garden Club meetings before Winter Break so we hope you can join us the next two Fridays at lunchtime. If you enjoy being outside getting fresh air, come spend your Friday lunch hour with us! This is one of the school's most popular lunch clubs, and we really would appreciate the extra supervision. Please email Garden Coordinator Stephanie Murphy to learn more! 11/3/17: Birds' Nest Fungi: What IS that? This week in Garden Club, students got to see bird's nest fungi, which popped up in one of our very own raised beds. A good thing ... and super cool too! Students worked like well oiled machines this week! We didn't get to the broom project but decided to make one broom for a demonstration next time and send the rest of the stalks home with students. These stalks work great for removing cobwebs from those hard to reach places. We also dug trenches in The Patch for potato planting after the fall break, planted seeds of Hungarian breadseed poppies and California poppies, and raked leaves for the compost bin. On the tasting table were two items made with by-products of our recent lemon popcorn treat and honeycomb lesson. Students juiced lemons and combined the juice with simple syrup to make refreshing lemonade. De-licious! In addition, believe it or not, our crops are already producing enough for us to make a salad. We harvested lettuce, arugula, kale, chard, green onions and Roselle leaves, then washed, chopped and tossed it all together with honey-lemon dressing which was made by students right here in the garden! Did we already say De-licious!? Garden Club will be on break until December 1st. However, while you are at school for conferences, please stop by the garden to take a look at the results of all the fall planting. Lastly, in addition to thanking the PTA and all the volunteers, we would also like to thank our sponsors for helping make the Garden Program possible. Please click here to view a list of the Del Mar Heights Garden Club sponsors. PS: Those who signed up to volunteer in the garden are sometimes sent emails regarding Garden Club or extra help needed in the gardens. If you are not currently receiving these emails and would like to, please email Garden Coordinator Stephanie Murphy to get on the list! 10/27/17: Why Do Bees Make Honey? This week in Garden Club, students learned why bees make honey. They were surprised to find out that it isn't for us... or for the bears. In fact, students learned that bears much prefer bee eggs and larvae, which contain lots of fat and protein. Bears will, however, gladly devour the honey and shake off stinging bees the same way they shake off water. Students viewed a frame of honeycomb and then later, tasted a spoonful of honeycomb right off the frame! Students were busy planting broccoli, broccoli raab, cauliflower, and leeks, as well as the seeds of carrots and parsnips. We also continued working on the broom project, raked up straw remnants, and moved old strawberry plants to the compost, to make room for potato planting. Did you know that this Friday is "Bring Your Parent (Aunt, Uncle, Grandparent) to Garden Club Day?" OK, not really, but students will be giving out free hugs to those who come to help! And, this week will be our last Garden Club meeting until December 1st. Please come take a look at the results of all the fall planting, which should soon supply us with enough crops for Garden Club, Farm-to-Table and the Farm Stand! We'll be digging trenches in The Patch for potatoes and replanting a few crops that got eaten by critters. Also, have you noticed we have not weeded at all this fall!?!?! Well, it's time. We are going to try to get some preemptive weeding done so the garden does not get out of control while the students are on break. 10/20/17: Goldilocks Plants- Too Big, Too Small, or Just Right? This week in the garden, we compared the Goldilocks plants from the seeds students started about a month ago. One of the experiments involved taking one cell of an over-planted 6-pack and dividing the plants into separate pots. We got 16 separate pots/plants out of ONE cell of a 6-pack! The students could not believe the difference in how well the individual plants thrived in their own pot, versus the remaining cramped cells which were competing for nutrients and sunlight. Since the crowded cells didn't look very happy, we did not plant those. We started working on our broom making project by "combing" the dried sorghum seeds off the stalks. We are about 1/2 way finished with combing so be sure to come to Garden Club next week to get in on the fun! We also removed Dakota Black Popcorn from the cobs - tough job. Students moved 4 straw bales from the greenhouse area to The Patch. One student noted exactly what was required and yelled "TEAMWORK!". Everyone pitched in, which made it look easy. At the gate to The Patch, students paused to consider how to maneuver the wagon through the gate, as it was not a straight shot (5-point-turn maybe?). And, despite the rumor, Garden Club will not be getting any horses :) The straw will be used for planting potatoes (and mulching) after fall break. Students also planted peas, kohlrabi, sunflowers, 2 types of kale, 3 types of cabbage and 3 types of bulb fennel. Next week we will be planting the last of our fall seedlings (onions, cauliflower, leeks, broccoli and broccoli raab) and hopefully seeds of carrots, parsnips, Hungarian Bread Poppies (which are the poppy seeds used for baking), Chia and California poppies! Thank you to the volunteers who arrived early to clean out raised beds so we were able to plant many of the remaining fall crops on Friday - and to everyone who helped with Garden Club this week - what a great turnout and boy did we plant! 4th-6th graders planted 3 types of kale and 5 types of beets; 1st graders planted 2 types of spinach, 2 types of cilantro, pac choi and mesclun. 1st grade students also harvested beans and the ever delicious and popular bell peppers, then washed and cut them up for the tasting table! Students collected and spread worm castings and also made plant markers for many of the crops. Next week we will be cleaning out one more raised bed and hope to plant most of the remainder of our fall crops. Remember the six-packs that had "too many, too few and just the right amount" of seeds? We'll also be taking a look at how they are doing. There are only 3 more Garden Club meetings before the November holidays and conferences. Since the 4th graders were learning about measuring last week, we decided to give them a little challenge. What do these two symbols mean? = vs. ≈ Students learned about the importance of estimation then estimated how tall the tallest sorghum stalk was. Before students were given the clue of the 1' ruler (compared to the segments on the stalk), one student estimated using his own height. Good job! Then, we harvested and measured (but mostly played with) the stalks. Furthering our estimation practice, students were shown two identical jars; one with ten watermelon seeds and one with a quantity of seeds which they estimated based on the clue provided. Nobody estimated the exact number but two students came very close and got to take home a Jack-Be-Little pumpkin and a tiny gourd from our garden. The sorghum (or broom corn) stalks will be dried for several weeks, then we'll make a broom! Third graders took home their Giant Cabbage plants Friday, compliments of Bonnie Plants. If the plant came home without instructions, here is the link: http://bonniecabbageprogram.com. We will also be growing one at school. For the tasting table snack we served roasted pumpkin seeds, pumpkin pie and pumpkin bread - all made with the from the New England Sugar Pie pumpkins grown at school. This week in Garden Club, we reviewed the status of our seed planting from a few weeks ago. We asked students to compare seedling success in three six-packs and share their observations. Some six packs had WAY too many seeds, some had too few, some were just right. Students saw with their own eyes what it looks like to place too many, too few and just the right amount of seeds in a cell. They also learned why and how to avoid this issue "next time" and what to do about it this time. We will monitor these same six packs over the next few weeks and see how well we did with the remedial correction we took. Students harvested the remainder of the lovely New England Sugar Pie pumpkins. What are we going to do with all those pumpkins you ask? We are taking the advice of one of our 2nd grade Garden Club students- "We should donate them to someone who wouldn't otherwise get one ... and they could make a pie at Thanksgiving." How incredible is that Heights Cares will be delivering about 25 pie pumpkins to the Food Bank next week. Students also cleaned up and discarded the dead pumpkin vines, harvested the rice and cleaned up the raised bed, explored the worm bin (with abundance of laughter) and then spread the worm castings to replenish the nutrients in the soil in one of our raised beds. For the tasting table this week, we served lemon rosemary zucchini bread, using zucchini harvested over the summer and frozen. Students helping prepare the bread were asked to "do the math". How can we cut this loaf to make 60 equal servings so each student may have a taste? We also set up a tangerine juicing station and students juiced the ever delicious Gold Nugget tangerines. Some students proclaimed it is the best juice ever and cannot believe there is nothing added! Next week students will be planting shallots, harvesting broom corn, preparing a new bed for the worms, and thinning strawberry plants. 9/22/17: What do Zucchini & Gummy Candy Have in Common? If you came to Garden Club this week, you found out that zucchini is gummy candy—at least in our garden! Really. Read on! This week in the garden, students were able to make fantastic progress because of the help of all the wonderful parent volunteers. Thank you! We cleaned out more spent summer plants from two of our raised beds and two of the half-barrels, propagated strawberry plants to take home, started on transplanting two citrus trees, harvested strawberry guava and bell peppers, started sweet pea flower seeds, scrubbed up old plant markers for re-use, cut up zucchini and green peppers for the tasting table and explored the worm bin. We'd like to give a big shout out to our 7th grade Garden Club alumni who came to school to help in the garden on Friday. They were fabulous mentors to our current students! For the tasting table, we served our beautiful and amazingly delicious bell peppers. In addition, for the moment you've all been waiting for ... Gummy Candy! What do gummy candy and zucchini have in common, you ask? Earlier in the summer, a few overachieving zucchini grew so fast in one week, they got too big to use in the customary fashion. So we turned them in to gummy candy! Seriously. Check out this recipe, then make your own at home using any overgrown zucchini lurking in your garden and fruit juice concentrate. Students also learned about citric acid, originally derived from citrus fruit such as lemons and limes, which gives things that sour flavor. Seventh graders tossed the gummy candy with a tiny amount of citric acid (mixed with sugar) for those students who like their gummies on the sour side. Wow! And ... mmmm! Flavors made for Garden Club were Black Cherry (sugar free), Strawberry Breeze, Guava-Strawberry and Pina-Colada. The students loved them! Next week students will be working in The Patch clearing out the pumpkin debris, fixing a compost bin and more. If the vegetable you are thinking of begins with any letter A through Z*, Garden Club has your back. Students selected a seed package, read the planting instructions then planted and labeled a planting six-pack. The plants will be grown out over the next several weeks, then planted by students throughout the garden later in the fall. We also directly sowed three varieties of garlic. Did you know that Elephant Garlic isn't really garlic? Technically it belongs to the onion family and, despite its name and size, the flavor is weak, especially when cooked. Students harvested and cut up a few more bell peppers for tasting but the star of the Tasting Table this week was freshly made tangerine juice, peeled and juiced by some of our 2nd grade students. Students were asked to predict what the juice would taste like just by looking at the ugly-duckling Gold Nugget tangerines. Most students thought the juice would taste as bad as the fruit looked. Turns out the ugly tangerines produced some of the most rich and delicious, fine flavored juice ever. Or, maybe the 2nd graders just have the magic touch! Students completed more cleanup by removing spent plants, planted two new blueberry plants and started on installing rain gutters and rain barrels. Come-on rain, this year we're ready for you! ​Next week, students will be continuing on with fall cleanup, propagation and other fun garden stuff. Oh, and we'll be eating gummy candy so you better come see what that's all about! Join us Friday - be sure to arrive at 11:30 to receive instructions before Garden Club starts. ​*OK, full disclosure, we are missing some vegetables starting with crazy letters like Q and Z. Any suggestions? 9/8/17: Fall Cleanup... and Math in the Garden? It was so nice to have our gardeners back in the garden this week. After a long summer without all the helpers, we sure were busy. Students new to Garden Club were given tours by some of our veteran gardeners. Second graders harvested crops of peppers, beans and tomatoes and washed them up for our chopping team comprised of of 3rd graders, who declared the job "hard" but did a great job! Students also harvested strawberry guava, removed cobwebs from the shade arbor and removed the spent Lemon Queen sunflowers, which was not nearly as easy as one might imagine. Thank you parents for the extra muscle digging up those stumps! The popcorn, one of three grass family crops planted by the students last spring, was eaten by critters over the summer so upper grade students removed the remaining bare stalks. While some students chipped away at the popcorn stalks, others made one of our tasting table treats using a bit of math. Their only ingredient measurement clue was 1 cup of sugar, the rest was instructions in "parts". They made from scratch passion fruit drink which turned out absolutely delicious. It was so fun to hear students discussing the "recipe" and how easy it was "you don't even need a recipe cause you just use parts" said one student. Click here for the "parts" you'll need to make this at home. Believe it or not, it is time to start plantings seeds for our fall/winter garden. We have a plethora of seeds and garlic to get started next week, as well as some additional fall cleanup, so please pitch in and join us Friday, September 15th. This week was the last Garden Club meeting of the school year, so we kicked back and enjoyed the fruits of our labor. Literally. With fresh peaches plucked from our very own peach tree, students made Peach Granita. Wearing gloves to keep their hands from getting too cold, students worked in teams to massage the ice bath containing the home made granita mix. It was divine and the students had a blast making it! For those not quite in to peaches, we also made blueberry and lemon granita. Students tasted all the flavors and all three were declared favorites! The star of our farm stand at pick-up on Friday was our peaches. Over a hundred pounds of freshly harvested juicy white-fleshed peaches. We also offered tastes of lemon verbena tea, dried lemon verbena leaves, garlic - on a lovely braid, onions, Bright Lights and Giant Fordhook chard, Red and White Russian and Lacinato kale, zucchini, spring salad mix, and parsley. Thank you - again - to all the garden helpers this year, but most especially to Stephanie Murphy, our garden coordinator. Our garden has absolutely flourished under her care and our kids just love her. Enjoy your summer and we'll see you back in the garden next fall! Questions about Garden Programs or Garden Club? Contact Stephanie Murphy. Students learned a few fun facts about popcorn but were way more interested in getting to work, so we got right to it and planted popcorn. We will harvest the popcorn in the fall, along with our other "grass family" crop, rice. On the tasting table was popcorn! Plain, plus a few batches of our own special house blend. Using items from the garden, we topped the popcorn with coconut oil, shaved lemon zest, sautéed rosemary, sea salt and pepper. Do try this at home, the students loved it. We thanked the lovely sweet pea plants for giving us so many beautiful and fragrant flowers this year, harvested the last few bunches, then retired the plants to the compost bin - it was a big job. Students also did a little hand watering and weed pulling. We were disappointed to see that critters devoured the lovely sweet potato slips that were planted by the second grade science classes, so we brought in reinforcement. Students replanted the extra sweet potato slips and then covered the rows with netting. Take that! Because next week is our last garden club meeting, we'd like to share a recent quote made by one of our students: "This garden used to be dead, and now (insert the look of amazement)". We replied by saying we could not have done it without you - the help of all the students, parents, sponsors and school administration. It's true. Thank you all for making our gardens beautiful, productive, educational and down right fun! ​Please join us for our last garden club meeting next week, June 9th. We'll have a fun activity and a sixth grade gardener send off. Questions about Garden Programs or Garden Club? Contact Stephanie Murphy. This week in the garden, it was all about seeing (and using) the results of our vermi-composting and setting up for another round. By the looks of it, the students were WILD about worms! Students learned how to separate the worms from their castings (some of the students found the smallest worms we've ever seen), prepare a new bed for the worms and make compost tea. Students used the worm castings and compost tea to fertilize plants throughout the garden. Students also picked sweet peas, raked and moved irrigation conduit. And, while the tiny hands of our students weren't quite strong enough, with a little adult help, we ended up with a beautiful braided garlic strand from some of the garlic harvested last week. The garlic will be cured for a few weeks and then shared with the Del Mar Heights families. While we didn't serve compost tea on the tasting table, we did serve Worms! OK, you know we're kidding, right? They sure looked lifelike and the students enjoyed them ... even though some of them melted a little. There is a new Lodge in town. "The Rollie Pollie Lodge at Del Mar Heights"! ;) Garden Club students learned all about Rollie Pollies this week. They learned that Rollie Pollies are basically land shrimp, from the crustacean family, breathing through gills - the only crustacean able to live on dry land their entire life. And, while Rollie Pollies are edible - and some people use them in recipes for scrambled eggs, fritters and scones - we weren't quite brave enough to try them prepared that way, but we did taste them prepared this way. It was a super productive day in the garden Friday! Students collected leafs, wood, miscellaneous items and, of course Rollie Pollies, and set up the new Rollie Rollie Lodge, moved hand shovels and the Sweet Potato slips from the greenhouse to The Patch (for planting later in the day by the 2nd grade science classes), picked sweet peas, hand watered, harvested Garlic and Onions (to go along with the previously harvested blue and red potatoes) for the Snooze Farm-to-Table event this Thursday, May 25th, picked buckwheat flowers then turned over the cover crop to nourish the soil, dug a hole for a new irrigation line, raked the main garden, started Lemon Queen Sunflowers (for pollination of crops in The Patch) and even had time for an impromptu Dance Fest mini-practice! Whoa! And if that weren't enough... just because it's the season, we reviewed rattlesnake identification, focusing on the triangular head, and the procedure if a one is spotted. On display was a replica rattlesnake and a real rattlesnake rattle so students were able to listen to the sound of a real rattlesnake rattle. ​The end of the school year is quickly approaching so if you haven't had a chance to join us for Garden Club, you better hurry. There are only three Garden Club meetings left this year! Please join us next week; we'll be working with the worm bin castings and preparing compost tea. Have you ever grown rice? Us either, but Garden Club students were totally up for the challenge! Students learned about rice, which is in the grass family just like corn, wheat, oats and sugar cane! We'll learn more about harvesting and processing in the fall but upper grade students had enough time today to plant a bed of Duborskian Rice, a Upland variety. On the tasting table was rice pudding, with a tiny dollop of whipped cream and a blueberry. We were pleasantly surprised that it was such a big hit, so we know you'll be needing this recipe. Second graders watered their sweet potato slips in the greenhouse for the last time and will be planting the slips in The Patch during science class next Friday. Third graders harvested the school's Giant Cabbage, which weighed in at 19 lbs. Lighter than last year but still just as beautiful! How is your Giant Cabbage at home doing? All students very busy harvesting a ton of "end of the season" produce to share with the families of Del Mar Heights. Displayed on our gorgeous new "Today's Harvest" board, designed by the amazing Alex Jensen, were our crops of the day to include: Chard, Giant Cabbage, Kale, Lavender, Lemon Verbena, Lettuce/Spring Mix, Onions, Parsley, Sweet Pea and wild flowers, and Zucchini. ​Please join us next week when we harvest onions and garlic for Farm-to-Table, and start a few summer crops. ​Back in January, Garden Club students planted three varieties of potato seed in The Patch for the Heights Cares and Farm-to-Table committees. This week, we checked to see if those potatoes were ready! Students learned how to tell when potatoes are ready to harvest and, with this knowledge, were able to identify one plant that was not quite ready. Students had a blast digging and harvesting 12 lbs. of Adirondack Red and Blue potatoes (for Farm-to-Table) and 19 lbs. of Yukon Gold (for Heights Cares) to donate to Feeding America. We also learned fun and interesting facts about the fascinating and historically important potato. The good folks at the Idaho Potato Commission shared brochures and potato recipe cards for students to take home. Thank you, Idaho, the Number 1 potato growing state! In celebration of potatoes, we had potato donuts on the tasting table! If your student is begging you to make these at home, they are very simple, and half the recipe is all you need for well over 100 delicious donut holes that can be made in a bread machine and baked in the oven! Just for a little balance, we also served fresh-picked blueberries. ;) Students also harvested the lovely, fragrant sweet pea flowers. Please join Garden Club next Friday as we prepare The Patch to plant sweet potatoes, pumpkins, sunflowers and more, as well as harvesting kale, chard, zucchini, lettuce and parsley. This week in the garden, students learned about scapes ... as in a long, leafless flower stalk. In our case, onions, lots of onions. Students harvested onions, along with a multitude of crops to include lettuce, chard, parsley, cilantro, kale and the beautiful and fragrant sweet pea flowers. The veggies and flowers, along with sweet potato slips, seeds and flower starts, were shared with families at the front of the school at the end of the school day. Students hand watered, fed the worms and tore up those used Earth Day crossword puzzle sheets soon to be used as new bedding for the worms. Second graders tended their sweet potato slips which are growing like crazy in the greenhouse. Third graders inspected the Giant Cabbage for cabbage worms, several of which were found, along with one already starting to make a cocoon. Putting some of our school grown onions to fantastic use, even though some students said they didn't really like onions, on the tasting table was caramelized onion dip, served with crudités! Students really liked the dip so, just in case you "need" the recipe, here it is: http://altonbrown.com/onion-dip-recipe-from-scratch/ Also on the tasting table was mulberries and passion fruit, which the students loved. In January, Garden Club students planted three varieties of potato seeds in The Patch for the Heights Cares and Farm-to-Table committees. Next Friday, May 5th, Garden Club will be harvesting these potatoes. How do we know that they are ready to harvest? Ask a Garden Club student, or join us next Friday from 11:30 - 12:30. We could really use some adult volunteers to help with this harvest ... it will be a lot of digging, and you may get dirty, but just think how much fun it will be! During this week's Earth Day Garden Club meeting, students learned about using cloth instead of paper napkins. Those who attended the lesson were rewarded with their very own cloth Garden Club napkin to take home and use. Some students who took advantage of dress alike day also selected napkins with alike patterns. Turns out, the Fairies also switched to cloth napkins, and now have their very own washer and dryer, as well as a laundry line. As promised, students investigated the worm bin to see which of the foods offered three weeks earlier (apple, avocado, banana, cranberries, lemon, passion fruit, squash and tomato) were their favorites. The results: these must be teenage worms as everything (except the cranberries) was pretty much devoured. There was a bit of passion fruit skin and seeds, as well as some avocado left (but we did put in a large amount of avocado). Everything else was completely gone. In a few weeks, the students will learn how to separate the worms from their castings, use the castings and then start a new home for the worms. Students also harvested carrots and sweet pea flowers. ​This week in the garden, students learned about vermicomposting! Kids learned fascinating worm facts, including how Red Wiggler worms eat (since they don't have teeth) and digest, how many hearts they have and why this particular type of worm does not survive well outside special habitats like ours. Our students also learned that worms eat newspaper and kitchen scraps (usually assisted by bacteria) and turn it into nutrient-rich garden fertilizer. Here's a great video showing worms at work! We also set up a taste test for our worms by placing eight trays containing different food inside our worm bin. Results will be uncovered in three weeks when we'll get to see which foods our Del Mar Heights worms like best! The choices include bananas, avocados, tomatoes, lemons, passion fruit, cranberries, squash and apples. What's your guess? On the tasting table was a treat with a flavor combination suggested by one of our students, Hollis Halpern: strawberry guavas (from the garden of course) combined with caramelized pineapple, then fashioned into ice cream. Think pineapple upside down cake combined with strawberries and cream. Everyone is learning about the tasty treats that can be made with crops grown and harvested directly from our own garden! ​It was a glorious day in the garden Friday! Students learned how to thin apples, and why. It's looking like we'll be a lovely crop this year! Students also learned about "cut-and-come-again" harvesting, then harvested a bounty of produce, including five types of lettuce, two types of chard, bok choy, broccoli and spinach! 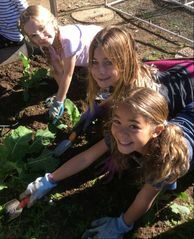 This week, 3rd grade students did a plant search in our new Kumeyaay Garden outside Mrs. Faulkner's classroom. This is a demonstration garden that contains some of the plants Native Americans, such as the Kumeyaay, used for food, fiber and tools. While not yet installed, chia seeds, from the plant Salvia Columbariae, were collected by the Native Americans using a basket called a seedbeater, thus our tasting table featured a snack of chia seed pudding. It's not a traditional Native American dish, but it was still quite tasty! Students in other grades helped rework the contents of our compost bin and provide additional water to the microbes who are working hard to turn our garden greenery scraps into rich soil (pictured on the right). At the front of the school in our Natives Garden, the California poppies and blue-eyed grass are blooming. Be sure to stop and take a look! 3/3/2017: Hill Up the Potatoes! In Garden Club on Friday, upper grade students helped "hill up" the potatoes in The Patch, while younger students planted dianthus, echinacea and dahlias. We'll be sharing these lovely flowers with you at our Earth Day celebration on April 21st! On the tasting table was jackfruit ice cream, lemon verbena ice cream and jackfruit leather. Yum! In the Kindergarten Garden, volunteers helped students with the annual stepping stone project. A ginormous thank you to the parent volunteers who worked very hard to make this project happen! We couldn't have done it without you! The stepping stones will cure for about a week, then be sealed and placed in the garden. At the end of the school year, students will take these mementos home. This month, the Cultural Heights program brought India to our school and the Garden Club brought India's agriculture to the garden! Students learned that India is the number one world-wide grower of Jackfruit, the largest tree-born fruit with each weighing up to 100 pounds! Wow! :) An unprocessed segment of a Jackfruit was on display so the students could see how it grows on the inside. The remainder of the "cleaned" fruit was on the tasting table. Students also tasted Jackfruit chips. The bag was empty. Enough said. In case you missed it, a whole Jackfruit will be on display in the library through next Friday. 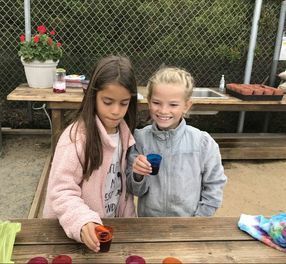 In the garden, students harvested all things "salad," made orange-honey vinaigrette, squeezed Page Tangerine juice, chopped garden green onions, tossed up a storm and served our very ownDel Mar Heights Salad to a ton of happy Garden Club students! We even included sun dried tomatoes from last summer's tomato harvest. We received a bunch of requests for the dressing recipe, so we think it was a success! Click here for the dressing recipe but keep in mind we didn't exactly follow it. On the tasting table, students were rewarded with chia seeds. Delicious! Okay, even though chia is currently used extensively in many nutritious ways, we also threw in some sweet and delicious Cara Cara Navel oranges, which get their beautiful pink color from the antioxidant Lycopene, and some Gold Nugget tangerines to sweeten the tasting. Next week, we'll be harvesting edible morsels from the garden and making a Garden Club salad! Since there will be no Garden Club gatherings on February 17th or 24th, we want to take advantage of the lovely greens that are ready to harvest! Please join us on Feb. 10th to help harvest, wash and toss our Garden Club salad. ​"Kindness Matters" shined brightly in the garden this week. Students harvested, cleaned and bundled bunches and bunches of gorgeous green onions, along with a few radishes, for donation to Feeding America! They also drew and signed beautiful signs to be delivered with the harvest. If you had to make string, would you know where to start? Join us next Friday, February 3rd, for Garden Club, and we'll show you one way the Kumeyaay and other Native Americans made string from the yucca plant. This is a hands-on activity students can bring home to finish. While the garden Fairies are thankful for Mother Nature's blessing of big rain, they sure do miss all the hard working students when Garden Club gets rained out. In anticipation of the storms, lots of kale, beets, cauliflower, chard and lettuce was transplanted earlier in the week. With all this fantastic rain, these crops should flourish and within a few weeks, students will be very busy harvesting! ​We hope to see you on Jan. 27th. Students will be harvesting and "packaging" green onions which will be donated to Feeding America. 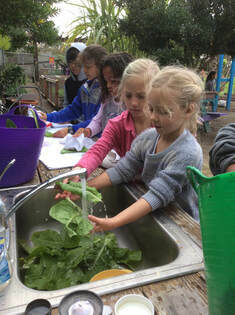 ​As Understanding Differences Month continues, we thought it would be fun to extend the learning into the garden! This week, working in pairs, one student wore a blindfold and was instructed how to plant a potato seed by their partner. Carrying the experience further, students then switched positions. The blindfolded students removed their stylish - and sure to become trendy - Dolphin blue - blindfold then led their newly blindfolded partner to the tasting table and assisted them in obtaining their snack of what else? ... multi-colored potato salad (see recipe here) and roasted potatoes with a ketchup based dip! Lastly, the blindfolded student had to locate the sink and rinse off their spoon. Wow, that was hard! And fun! Did your child notice different sounds, smells, textures or flavors while blindfolded ... did they rely more on other senses? Join us next week when we will be transplanting a myriad of vegetables, weeding and discussing "what to grow next." If you can't make it to Garden Club, feel free to send your "what to grow next" input via email, but remember that students have much more of an opportunity to participate and learn when adult volunteers assist. Please join us next Friday, January 20th. This week in the garden, students learned about four types of sponges- man made, luffa (which were grown in our garden), wild cucumber and sea sponges. Students compared sponge textures while using them to wash the spoons they used to taste the delicious strawberry guava ice cream made with fruit from our garden. For the recipe, click here. Also on the tasting table was strawberry guava "leather", limes and lemon verbena from the Kindergarten garden. Upper grade students learned a few pruning techniques, specific to espalier apple trees, then practiced pruning the school's espalier apple trees. Lower grade students put the finishing touches on our potato trenches by adding kelp fertilizer. We also removed leaves from the apple trees, planted cover crop seeds in the half-barrels and did a little weeding. Next week we'll learn about how potatoes grow then plant red, white and blue potato seeds! The potatoes should be ready to harvest in late April. Weather permitting, we may also transplant beets and kale. 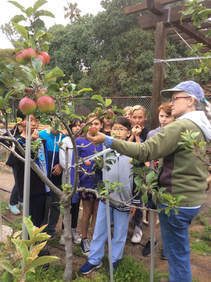 ​Over Winter Break, many of the fruit trees were pruned and Native Garden signs and a small worm bin were installed. Everything looks so clean and refreshed! While inclement weather over the last few weeks has brought much needed rain to us, it also cancelled our last Garden Club gathering before break. So come this Friday, Jan. 6th to find out what grows in the sea, or in our garden, or is man made, and can be used for the same purpose. Students also will learn how to prune espalier apple trees and work on other trees in our garden, as well as prep the potato patch for planting. ​This week in the garden, students assembled new compost bins, which will serve to neatly collect garden greenery and generate rich compost. We also continued working on trenches for potato planting, harvested luffa and strawberry guavas and adorned the Fairy Garden with new holiday treasures. On the tasting table were dehydrated persimmons from last week's harvest, along with Satsuma tangerines. Do you know what grows in the sea, or on land, or is man made, and can be used for the same purpose? Hint: Many of us use these daily. To find out, take an hour out of your busy holiday week & join us this Friday, Dec. 16th, for our final Garden Club gathering of 2016! Students have more opportunity to participate and learn when parent volunteers assist. This week in the garden, students prepared the soil in the 1/2 barrels for the next planting, began digging trenches for potato planting in The Patch, learned how to use and take care of hand pruners and harvested persimmons. Upper grade students were taught knife safety and usage skills and were then supervised while preparing the fresh Fuyu persimmon harvest and dried Hoshigaki persimmons for our tasting table. Next week, students will assemble new compost bins, plant cover crops in the half barrels, continue with the potato planting area preparation and harvest luffa. Over break, garden Fairies were busy sprucing up the Natives Garden at the front of the school. Please ask your children to be careful of these very fragile plants and be sure to walk and ride bikes on the sidewalk, rather than through the garden. Garden Club returns Friday, Dec. 2nd! Students will be harvesting and sampling Fuyu persimmons from the garden, cleaning out summer plants from half barrels, repotting an olive tree, checking on the Fairy Garden and beginning preparation of The Patch for potato planting after Winter Break. The garden was filled with more magic than ever on Friday as students adorned our new Fairy Garden with magical embellishments and fairy dust! After learning about fairies, students and parents worked their magic in the garden. They harvested pomegranates, cleared spent vines, harvested strawberry runners and strawberry guavas, removed the remaining tomato plants and prepared the bed with compost for the next planting--all in record time! On the tasting table was limeade infused with rosemary from the "Kinder-Garden," as well as strawberry guavas and pomegranates, also from the garden. Friday in Garden Club, students did the Hoshigaki! Actually, they'll be doing this at home, taking with them Hachiya persimmons (and a measured piece of string) to prepare Hoshigaki-style at home. If your child is one of these lucky students, please assist them with peeling and using the string to hang the fruit in a sunny window. After a week, students should start gently massaging the fruit every few days for approximately one month, at which time they will be rewarded with a lovely piece of dried fruit. ​Do you believe in magic? If so, join us next Friday for a truly magical experience. It will also be our last Garden Club gathering until Dec. 2nd, due to Veteran's Day, minimum days and Thanksgiving break. ​This Friday, students learned a little bit about the history of pomegranates and one way to quickly (and with less mess) remove the numerous arils, then tried this technique for themselves using fruit from our garden. 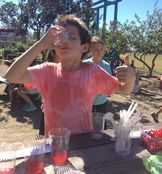 Students sampled two varieties of pomegranate arils, as well as freshly "squeezed" pomegranate juice! We also weeded, transplanted onions, hung signs, matched gloves and sanded the arbor in preparation of painting. Upper grade students planted radishes and mustard seed cover crops on their own, interpreting planting instructions from the seed packets. 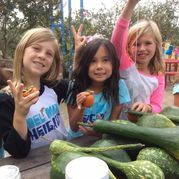 ​Friday in the garden, students learned about the different types of persimmons, how to know when each can be eaten, a traditional way persimmons are dried (Hoshigaki) and what persimmon leaves may be used for. On display were wild persimmons used by our Native American people, grown without supplemental water, fertilizer or human intervention. Students learned how to protect the fruit on our small persimmon tree from birds and other wildlife, then practiced this method on our tree. Although it may look a little silly, with this technique we'll be harvesting a lovely crop of persimmons in a few weeks. Students work beautifully as a team to maintain our garden. It sure doesn't seem like work when we work together with everyone pitching in. We removed scales from the lemon trees, weeded, picked up trash, re-bagged mulch, removed dead leaves from the gourd vines and added compost to raised beds. Students also "bagged" persimmons, harvested luffa, strawberry guavas and apples. The strawberry guavas and apples were shared on the tasting table, along with lemon verbena tea which was made from the leaves of the plant in the kindergarten garden. ​Garden Club students tasted watermelon rinds prepared as a pickled "fruit" (like bread and butter pickles) and as a curry "vegetable." The dishes were met with mixed reviews but we are thrilled that students and parent volunteers learned that previously discarded watermelon rinds are edible and may be fashioned into something just as delicious as watermelon itself. Students were busy starting fall crops of carrots, garlic, cauliflower, broccoli and chives, disassembling plants in an old planter, replenishing soil in raised beds and harvesting Arbutus Unedo (Strawberry tree) fruit using a picker and then tasting the fruit. Last Friday, students tasted school grown watermelon, compared to store bought, then tried their luck at seed spitting. Two students tied, each spitting a seed 20 feet, with a close second at 17 feet, WOW! Students also harvested Yokohama squash and tasted Sweet Cal Wonder and Chocolate Bell Peppers freshly picked from the garden. October is National Farm to School Month, which is great timing because the Garden Club "farmers" will be planting seeds almost every week during October. We'll start by planting chives, leeks, cauliflower and broccoli. Students will raise these plants in the greenhouse until they are ready to transplant to the The Patch. Last Friday in Garden Club, the now 3rd grade students harvested the popcorn they planted last year and cultivated and prepared the beds for cover crop planting next week. Other students planted beet seeds, moved enriched dirt from worm bins to the raised beds, added dirt to low spots near the apple trees, tended tomatoes and harvested silverberries. The upper grades enjoyed their lunch under the Lemon Tree Shade Arbor while waiting their turn for Garden Club. Students tasted dried and fresh jujubes and candied fennel stalk. Come to Garden Club next Friday between 11:30 - 12:30. We will be harvesting and tasting watermelons, as well as trying our luck at seed spitting. So roll up your tongues and join us! Students harvested and tasted school-grown green peppers and compared them to those from the grocery store. Let's just say the container with the store bought peppers was still pretty full at the end of the day! From last week's Silverberry harvest, Silverberry jam and Silverberry leather were served. Also, students were introduced to the sight, texture and taste of Australian Finger Limes. Garden Club was busy harvesting, trimming up the popcorn and tomato plants, cleaning up old sunflower stalks, hanging a thermometer, moving dirt and building materials and installing a hasp on a storage box. 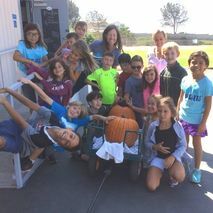 Earlier on Friday, the 2nd grade classes of Mrs. Waldal and Mrs. O'Farrell harvested the pumpkins that they planted as 1st graders last year. Thank you for the great cooperation and teamwork 2nd graders, those pumpkins were heavy! Do you Jujube? You will if you come to Garden Club next Friday! Last week students learned an easy way to plant tiny carrot seeds, made descriptive crop signs, harvested Japanese Silverberries, weeded and cleaned scales off the Pink Guava tree. Also, Mrs. Rollins' class harvested two pumpkins from The Patch. The other 2nd grade classes will harvest their pumpkins soon! You know what a finger is, and you know what a lime is, but do you know what a Finger Lime is? Come to Garden Club this Friday from 11:30-12:30 p.m., and we'll show you! We'll also harvest a school-grown crop and conduct a taste test, comparing our produce to store bought. Parents welcome and encouraged! Check out these recipes for Sweet Potato Maple Pecan Quick Bread and Sweet Potato Butter on our recipes page. This past week in the garden, 3rd grade science and Garden Club students harvested hundreds of pounds of sweet potatoes. On Friday, Garden Club sampled raw sweet potatoes, baked sweet potatoes, sweet potato bread and sweet potato applesauce - all made fresh from the harvest! A big thank you to all the parent volunteers this week! Come join the Garden Club this upcoming Friday (Sept. 9th) at lunchtime for sign-making, weeding, cultivating and carrot planting! Students adore seeing their parents and will want to introduce you to their friends. 8/26/2016: September in the Garden: Ah the Bounty! The garden has been flourishing over the summer and students are getting their hands dirty! Remember those sweet potatoes your child propagated in science class last year and then planted in our school garden? Over the summer, the sweet potatoes grew and are now ready to be eaten! 3rd grade students will harvest their sweet potatoes during their first science lab class this Thursday, September 1st,...and we need your help -- we need 3rd grade parents on Friday, Sept. 1st from 12:30-2:30 to help with the harvest. Mrs. Minarik and our garden coordinator, Stephanie Murphy will both be there for guidance and instructions. No green thumb required! Sign up HERE! Also during September, Heights Cares will be planting crops for Feeding America! The Garden Club will be harvesting silverberries, hot and sweet peppers, lots of tomatoes, popcorn, watermelon (to include a seed-spitting event) and possibly some over eager pumpkins! They will also be tending to the remaining crops, cultivating areas for replanting and other garden responsibilities.